Sabina Zeba Haque was born into a household of multiplicity. Her parents met on a bus near the University of Kansas where her Pakistani father was an architecture and engineering student. Her mother, a printmaker from Springfield, Ohio, designed cards for Hallmark, back when the work was still done manually. 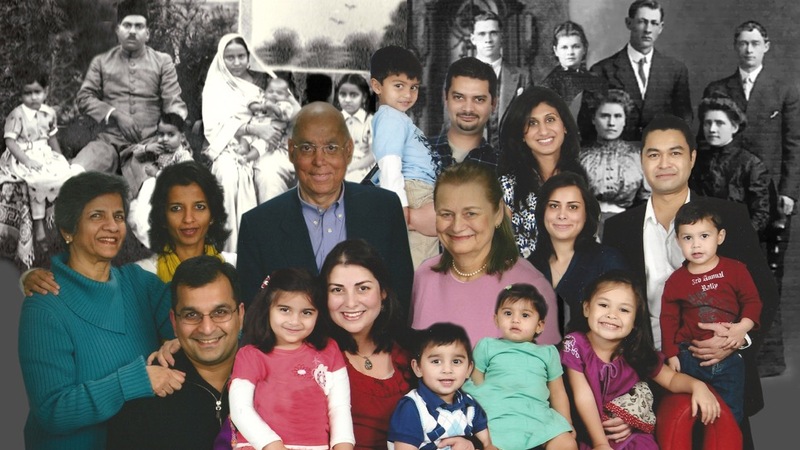 The couple permanently moved to Karachi, Pakistan in the 1970s to raise Sabina and her siblings. Sabina’s work as an artist spans decades, mediums, borders, and themes—from the intersections of place and identity, to, more recently, the stories and experiences of community, near and far. Her family’s own stories of immigration, refuge, and international roots continue to shape her work, and her artist mother, who is also an educator and activist, remains a pivotal role model. I was raised in Karachi, Pakistan in the `80s by an American Christian woman who married my father, a Muslim who migrated from India to Karachi. We celebrated Eid with my muslim relatives and celebrated Christmas with my mother. I lived in this very multicultural home, and was bilingual in Urdu & English. My parents and sisters still live in Pakistan. When I was growing up in Karachi, the U.S. was funneling arms through Pakistan and funding Bin Laden, so I was living that history. At that time, the country was run by a military dictator—a very oppressive regime. I moved to the U.S. in 1992 for college. When 9/11 happened, America was still waking up. No one seemed to have any idea what had gone on in the previous two decades. I, on the other hand, grew up with a lot of knowledge around politics and the affected communities. What has your process been like in deciding which medium to use for a particular project? The process and act of drawing is really important to me. I was trained as a painter/drawer, though I now see myself as a multi-media artist. For the longest time, I was working in the 2D realm, then with the onslaught of Apple, I was able to digitize anything and everything. I used to act out some of my early work, like my self portrait photo series, “Muslim American Woman.” My process was really about the idea of how we use our body to express issues around identity. The performance was a very important part of the process that was not made visible to the viewer, but now is visible and deliberately part of my art practice. In the last couple of years, storytelling has become really important too. How do we communicate not just those key images, but what happens in between? My artwork explores the two places I call home: the U.S. and Pakistan. Sometimes they are in conflict with one another. In Hood River, we have one of the largest drone manufacturers [in Oregon]. The drones that are made in my backyard are flying over the backyards of people in Pakistan and killing civilians—3,000 civilians. In 2013, a [Pakistani] grandmother was killed while gardening in her backyard. Her grandson [testified] to U.S. congress and said, "I no longer love blue skies. I prefer gray skies. The drones don't fly when the skies are gray." I had to tell that story. I made this stop-motion animated film about drone warfare [in 2015 with] videographer Ian Lucero. “Remembrance” documents the process of creation and destruction, and also [commemorates] the people who have been lost. That blew open my process. I started to integrate my community-based practice, which I was doing with teaching, into my art-making. With the oral history project, “Under the Same Blue Sky,” I went to [IRCO] Africa House and worked with Somali women there for a few months, developing trust. Six women shared their refugee and immigration stories. I made these hanging translucent screens, covered in their handwritten stories, [and] paired [them] with their recorded story. We had a panel at the Portland Art Museum where Somali woman activist, Lul Abdulle, and Djimet Dogo, director of Africa House, spoke. [The event] drew a large African immigrant audience, many of whom were first-time museum visitors. It's really important as artists to center voices of color and people who have not been given that opportunity within cultural institutions. If you want to do this right, bring community members, give them a stipend, [and] give them a voice. Art is always tied directly to community. For more on Sabina Haque’s art, check out their extensive body of work online which includes information on their past residencies, zines, “War Games,” and more. What is one project that you're particularly proud of? The project and research I did with the Portland City Archives led me to work with the eastside Portland community and engage with them around issues of displacement and exclusion. I was an artist-in-residence exploring the changing identity of [Portland] over the last 35 years. Together with the community, we found really creative ways to communicate that [through] film, oral histories, theater, zines, and street performances. That was three years of work with multiple events. How has creating your art changed your own understanding of identity and place? Identity is constantly shifting and places are constantly shifting. Our perception is also shifting. I am American, but there's a whole side of me that's Pakistani. I talk about the privilege [of] looking the way I do, being able to blend, and being a halfie. I can start speaking Urdu. I can code-switch. We get locked into these boxes and I try to find a way to unlock those stereotypes. When I first arrived in Portland [in 2006], none of the stuff we're talking about now was being talked about. When I started delving into the city archives—the systemic historical racism, this whole identity of a place—started to make sense. It feels like a façade, masking deeper societal shifts. We have one culture of manifest destiny, which Portland was founded on as this white utopian city, and now we have all these young people [who] are mixed race, brown, or Black. What's happening between these various points in identity? How are we going to find ourselves? It's being reflected on the national stage as well. Portland's changing, Pakistan is changing, and you're changing as we speak. I am really interested in those shifts—documenting what those mean and how we navigate through and between those frames. [My work explores] how we get past façades and to the real individuals or bones of a place. How do you feel Portland informs or shapes your work? Portland has a long way to go, [and] sometimes I get frustrated with all the people who act so liberal. With Trump in office, historically white institutions want to talk about refugees and I’m like, 'I've been talking about these things for years!' I hope we continue to work through this and not just through the Trump years. Our cultural institutions need to represent and be accessible to all citizens. The mainstream image of artsy Portlandia seems phony—the tourism, the artisanal everything—and yet we're getting rid of all our cultural institutions, and our local art spaces are being devoured by gentrification. We have to fight it, be active, and do more! Unless we do the advocacy work, nobody in city hall—or the city developers —are going to do it. We have to stand up and yell and scream about it. We have to keep them honest. They're representing us. I did a talk about the East Portland project on 82nd Ave. A lot of white people showed up and I said, 'You all, living on the other side of 82nd (and I live there too), you have the privilege to cross over this barrier. It's a new red line. You have to start engaging.' It’s not enough to just go to art events—go to cultural events. The people who are going to lead the way are the non-profit activists. What are you working on right now and what's next? I am working on a drawing installation and a performance called “(Un) Belonging” exhibiting in November 2019. My grandmother on my American side came in 1904 as an immigrant from Norway. I have her Ellis Island documentation, and yet my first-generation uncle, who knows his immigrant history, has forgotten it. He was welcomed, and now they're pushing the new wave of people out. He told me if I don't like it, why don't I go back to Pakistan? My own uncle. In “(Un) Belonging,” I fabricated portals [with] multiple ways to enter. A projected animation of the entire world map goes through the cycle of creating the world’s borders. This cycle of welcoming and excluding is explored through projected shadow movements which transgress these borderlines. I choreographed the movement cycle with dancers Simeon Jacob, Michele Ainza, and Suba Ganesan. They engage with the projections. How can Portland support you and your community? Money talks, for sure, but the key to the golden temple is letting us into these institutions. Give us space. I have all of the qualifications and yet I don't have the network that my white fellow artists have. There's a connection they have, that I don't, and I'm still on the outside. My art installation of the Somali women’s stories was exhibited for a just one weekend at the Portland Art Museum’s Miller Gallery, their community space. We need to be recognized, not just for our brownness, but also for expanding the creative conversation, which will result in expanding the institution’s mission. When I go to Pakistan and I have a art exhibit it's not about being brown. It's about making work about the issues that are important. We need to envision new spaces. We need to rework and restructure existing institutions, but really we need to invest in our own spaces, and people need to give us that credit.